Today we’d like to introduce you to Joe Baker. My wife studied in France in college, so for our first wedding anniversary she took me to Paris. At that time, I was completing my last year of service the United States Army and was planning to use my G.I. Bill to attend culinary school. We stopped into Laduree for French macarons, and as she savored that delicious confection she joked “If you learn how to make these, I’ll love you forever.” The rest is history. In 2008, I enrolled in the pastry arts program at L’Academie de Cuisine (outside of Washington, DC), and for the next six years I worked in a number of prestigious culinary institutions, including Citizen in Washington, DC; Pujol in Mexico City; the RK Group, Las Canarias, and Ostra in San Antonio; and the Omni, Mansion on Turtle Creek, and Le Cordon Bleu in Dallas. In 2014, I lost my job just two weeks before our first child was born. I didn’t want to start a new job with brutal restaurant hours at such a crucial time for my family, and a good friend suggested I sell my baked goods at the Coppell Farmers Market using the Cottage Act. After pulling an all-nighter wrestling with a newborn and some poorly-designed truffle packaging, Joe the Baker debuted at the market in April 2014. Within six months, we moved the operation from my home kitchen to a commercial kitchen, incorporated an LLC, and revamped our website (www.joe-the-baker.com) to include online sales. Currently, our company includes myself (chef/owner), my wife (photographer, webmaster, bookkeeper, and public relations), and my pastry assistant, Rachel Wilson. In addition to the Coppell Farmers Market and website, Joe the Baker pastries are available at Royal Blue Grocer in Highland Park and Liberation Coffee Company in Coppell. We are always looking to expand to new retail outlets, with the hope of opening our own storefront in the Coppell area. We’ve learned a lot of things the hard way over the past 3 years; sometimes it feels like we’re building the plane while we’re flying it. Finding the right packaging has been a constant challenge, but we’ve finally found boxes that are both inexpensive and require minimal assembly. We’ve seized a lot of opportunities, such as new markets and retail outlets, that simply haven’t been worth the trouble. Currently, our biggest challenge is our lack of a storefront and dedicated commercial kitchen. We get a lot of requests for large or last-minute orders that we have to turn away because we simply don’t have the resources to fulfill them. Alright – so let’s talk business. Tell us about Joe the Baker – what should we know? Joe the Baker is best known for our French macarons, which have the perfect ratio of shells to filling and come in a variety of unique flavors. We are the only bakery in the DFW metroplex to offer a giant macaron cake (called the Big Mac) or a piecaken. We also provide gluten-free products, European and glazed cakes, quick breads, seasonal confections, classes, and catering. While we can (and do) make children’s cakes, we are not by nature a “cutesy” bakery; our style is classic and elegant. Chef Baker is a French-trained pastry chef with extensive fine-dining experience who can whip up just about any bread or pastry you can imagine, so our goal is to open a coffeeshop bakery that offers a wide variety of products and hosts recreational baking classes. 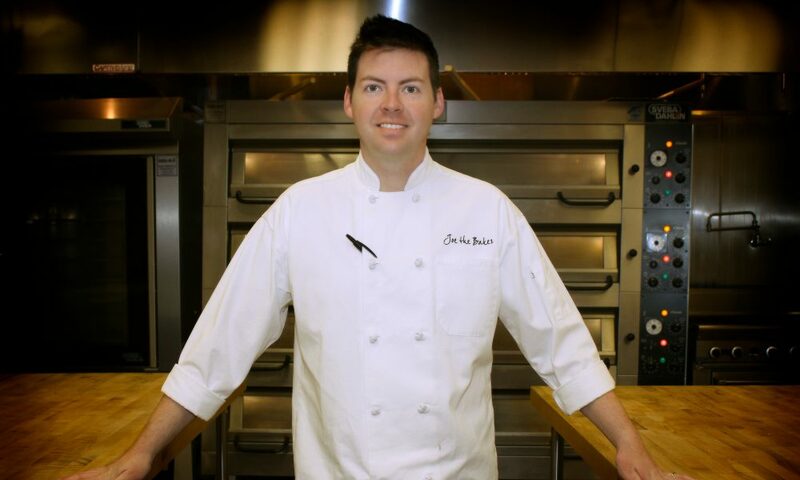 Chef Baker has been featured in a number of competitions and publications, including Food Network’s Sweet Genius, King of Cones, and Beat Bobby Flay; the Starchefs.com International Pastry Competition; and So Good magazine. We are fortunate to be surrounded by a great community in Coppell. The Coppell Farmers Market is a tight-knit group of vendors who constantly promote one another, and our fabulous customers are very loyal. We have also received a great deal of support and encouragement from our church family at Riverside.